This diet product also breaks the mold by choosing some different ingredients that we don’t normally find in diet pills, and even tries hard to avoid ingredients which are known to commonly cause allergic reactions in many people. But will LA Muscle’s product strip away the pounds from your body, or just the dollars from your wallet? 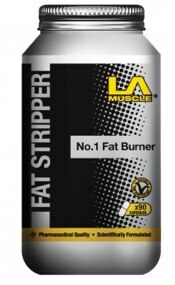 Fat “Stripper” is actually intended to be a fat-burner. It contains a combination of ingredients which LA Muscle, a fairly reputable maker of weight loss products, claims will increase metabolism of fat while promoting lean muscle development and suppressing the appetite. All this, and without the use of stimulants. Many users have an adverse reaction to the caffeine and similar substances in other weight loss products, so Fat Stripper may work for dieters with sensitivity to stimulants in their supplements. This supplement has an interesting list of ingredients, not completely typical of the average diet pill. 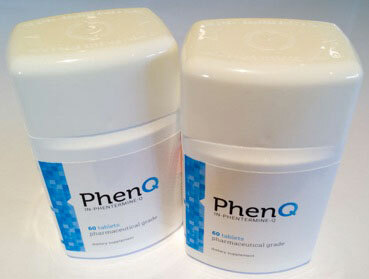 To start with, inositol and choline, two similar compounds, are used to assist in breaking down fat. However, there is no evidence that either of these ingredients actually produce this effect. L-carnitine and betain work to improve muscle development, helping to support the growth of healthy and toned muscle tissue. Their actual role in weight loss has never been established, so it is unknown what role they’re intended to play in the fat-burning component of this formula. “Methion”, probably intended to mean methionine, is an amino acid which has been associated with fat loss, liver maintenance, and decreasing cholesterol in the blood. The most well-known of the included ingredients, chromium piccolinate, has been determined through National Institute of Health studies to not be effective at promoting fat reduction. At first glance, it would appear that LA Muscle Fat Stripper has good support in the press, earning endorsements from popular UK athletes like Stephen Wells, Ricky Martin, and John Donovan. But it turns out that most of the celebrity endorsements are paid, meaning they’re not indicative of the product’s effectiveness as much as of its marketing budget. Online reviews for Fat Stripper, paid endorsements notwithstanding, appear to be mixed. There are many consumers who have reported success, but the majority of these users are also engaged in casual or intense exercise programs. This makes it difficult to reliably claim that these results are a benefit of the supplement or more because of the exercise routine. One thing that LA Muscle Fat Stripper appears to have on its side is a lack of side effects. Because its ingredients are vitamins, substances chemically similar to vitamins, and generally natural compounds, it is apparently free of the discomforting side-effects common to caffeine-based products offered by competitors. As always, however, check the ingredients in the product and make certain you’re not allergic to anything that’s included in the supplement. If you have any questions, or experience any reactions to the product, immediately cease taking it, and consult your physician. Even though LA Muscle has a good reputation for effective weight loss products, it’s hard to give this item a ringing endorsement. The brand only goes so far in speaking for a supplement’s quality, before it has to begin speaking for itself, and Fat Stripper sadly has little to say on its own behalf. 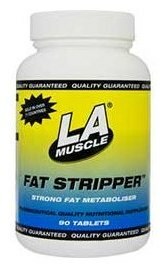 Unfortunately for this product, it’s hard to tell if LA Muscle Fat Stripper actually does anything. The greatest success stories were to be found with individuals already well on their way to achieving their respective weight loss goals by exercising and maintaining a proper diet, and the active ingredients in the supplement are in such insufficient levels that it’s hard to make a case for Fat Stripper’s effectiveness in the field. The official LS Muscle website would be a good place to start. Because of the steep price tag of £49-55 per 15 day to one month supply of LA Muscle Fat Stripper, this product does not present much value to someone who isn’t already convinced of its effectiveness as a weight loss supplement. We can think of much more reliable ways to assist your fat-burning regiment, and better ways to spend that kind of money.